Clovis is the county seat of Curry County in eastern New Mexico, with a population of just under 38,000 people. A largely agricultural community, closely bordering Texas, Clovis is noted for its role in early rock music history and for nearby Cannon Air Force Base. The Atchison, Topeka, & Santa Fe Railway system helped to establish Clovis over a century ago, and for that railroad and its successor BNSF Railway continues to be a major hub of operations. The city is named after the locally-based Clovis indigenous culture. After the discovery of several “Clovis culture” sites in eastern North America in the 1930s, the Clovis people came to be regarded as the first human inhabitants who created a widespread culture in the New World. Clovis people are considered to be the ancestors of most of the indigenous cultures of the Americas. 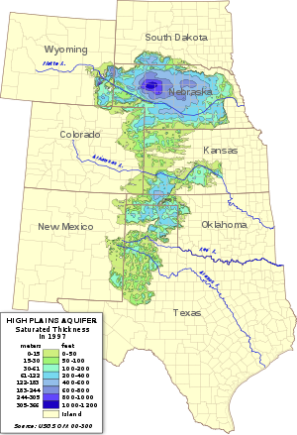 1997 USGS map shows saturated thickness of the Ogallala Aquifer. Clovis is near the southern end of the Ogallala Aquifer, which is a shallow water table aquifer surrounded that’s being rapidly depleted (mostly by agriculture) beneath the Great Plains. One of the world’s largest aquifers, it underlies an area of approximately 174,000 square miles (450,000 square kilometers) in portions of seven other states, besides New Mexico: South Dakota, Nebraska, Wyoming, Colorado, Kansas, Oklahoma, and Texas. Some estimates indicate the remaining volume could be depleted as soon as 2028. 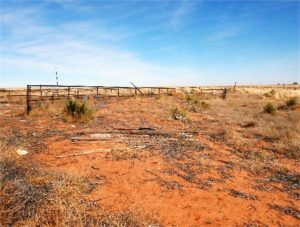 Many farmers in the Texas High Plains, which rely particularly on the underground source, are now turning away from irrigated agriculture as they become aware of the hazards of over-pumping. This is a major step forward, but merely reducing the rate of depletion isn’t enough. True sustainability can only be achieved by recharging the aquifer; restoring over a century of depletion. Back on December 21, 2017, the city of Clovis, New Mexico published a plan using an ambitious, public-public partnership to revitalize their agricultural economy and restore the environment by recharging the Ogallala Aquifer. 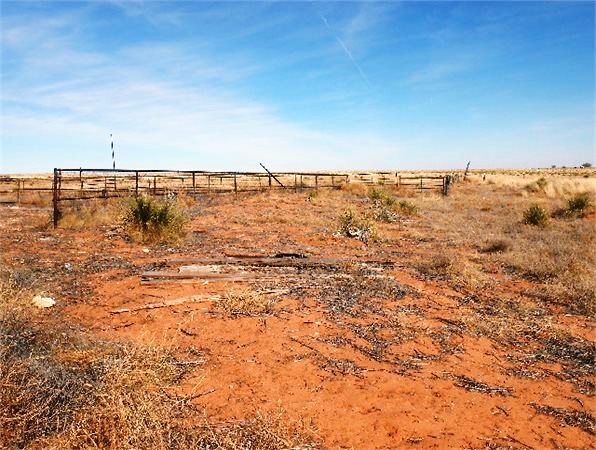 A dessicated ranch for sale near Clovis. To achieve the partnership’s goals of restoring wildlife, improving stormwater management, and increasing various water retention benefits, their strategy prioritizes restoring the area’s playas (dry lakes) to help recharge the aquifer. Now, in June of 2018, the city has created the Playa Lakes Joint Venture to make that plan a reality. The joint venture aims to proactively reverse the decline in the local water supply through playa (dry lake) restoration and protection, as well as reduced use of irrigation based agriculture. Featured 2015 photo of a quiet evening in downtown Clovis by ArdenZ87 via Wikipedia. Read full Master Water Assurance Plan (PDF).